An organizational virus is an employee who is a threat to an organization, but appears to be an asset. Biological viruses invade their hosts by not appearing to be a threat. They are able to enter cells because the body’s immune system doesn’t associate the proteins on the outside of the virus with any recognized threat. 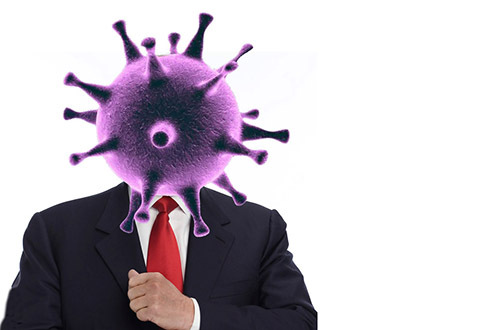 Organizational viruses can easily invade a corporation, a nonprofit or a university. They are welcomed in because they are seen as assets rather than liabilities. A 2010 study published in the Journal of Research in Personality examined what separates psychopaths who end up in prison and psychopaths who succeed in business. Researchers discovered successful psychopaths exhibit the same core features and traits as other psychopaths: dishonesty, exploitation, arrogance, low remorse, minimizing self-blame, callousness, and a tendency to constantly look out only for themselves. But there was one difference. Successful psychopaths were far more conscientious than those who ended up in prison. The biological virus once it has invaded a cell, sets about to replicate itself. Once it has made multiple copies of itself it breaks out of the cell and spreads to other parts of the body. The organizational virus, hired into an organization through the hiring process, sets about to spread its influence. This is accomplished through various tactics most of which are aimed at impressing superiors. Organizational viruses are always supportive of upper management, relentlessly upbeat, and willing to do extra work. They know how to give off an air of dedication and authority. Their objective is to move up the ladder, control more employees, obtain larger budgets, and marshal greater influence. Behind the scenes viruses create real damage. They take credit for other people’s accomplishments; blame others for their mistakes; lie whenever it suits them; spread gossip that turns people against one another; and threaten, demean and bully subordinates. Frequently viruses are narcissists who endlessly extol their own virtues, as a mask that covers their true nature as a human wrecking ball. So how does an organization avoid being infected by a virus? The first line of defence should be the hiring process. Here it is important to remember that the best gauge of future performance is past performance. An organizational virus will have damaged previous places of employment. Uncovering the damage may be difficult because of privacy issues. But some effort should be made to obtain candid responses from former subordinates and coworkers as well as references and superiors. Perhaps the easiest way to spot the virus is to search for lies on the resumé. Viruses are almost always accomplished liars. Check the accuracy of job titles listed on the resumé, looking back at least five years, ideally ten. Organizational viruses will often give themselves more impressive job titles. Also check the start and end dates of employment. Viruses will often modify these dates to hide periods of unemployment. Upper management is the part of an organization’s immune system charged with removing employees who are serious liabilities. Viruses know they are vulnerable if they look like a problem to management, so they make very effort to look like an asset. Successfully played, management typically fails to initiate an immune response when problems arise, or generates a response that is so weak the virus can continue to wreak havoc. Organizational viruses come in many different strains, which vary in their toxicity. But a virus at the very top of an organization is the most serious threat because it has the widest influence. Great care must be exercised in hiring a CEO, because it is usually difficult to get rid of them once they are exposed. Once again the approach should be to look for lying and exaggeration. If a headhunting company is going to to be hired, make sure it has a track record of spotting lies, detecting hidden damage and rejecting viruses. Once hired as a CEO, a virus will focus on co-opting the board, the only real threat to its influence. Usually this is dead easy. Most board members have little idea of what a board is supposed to do. Where they should be the equivalent of killer T-cells, more often they are the equivalent of algae. John Carver, the author of Boards That Make A Difference and the leading authority on board governance, points out that the board has only one employee, the CEO. The CEO has all the rest. The CEO must be accountable to the board for seeing that the entire enterprise meets board expectations. But board members often don’t realize that ensuring CEO accountability is an essential part of their job. When this happens the board can become a de facto palace guard that protects the CEO – a perfect setup for a top-level virus. Make sure that board members only hear from you or your people. At my institution the president insisted that faculty not to speak to anyone on the board! Populate the board with friends and allies. Above all, make sure the chairman of the board is a friend or ally. At my institution, the president installed a former student of his as board chair. Present a picture of relentless dedication. If there are apparent problems, blame external sources: government, market forces, unions, faculty, previous administrations. Avoid tricky issues by placing them at the end of meetings with a long agenda; by filling up meeting time with trivial presentations, and by talking more than anyone else. Sidestep board members who may have differing opinions by creating a small executive committee of trusted board members that meets privately and engineers decisions for the whole board — a widely recognized (and all too common) bad practice. Ensure that annual performance reviews are waived, or conducted by allies or subordinates. Behind the scenes, slag anyone willing to offer an independent view or a critical opinion. Produce budgets just before they must be approved so that board members have no time to read contents and ask questions. Put large sums of money into ambiguous categories such as “other” so that you can do whatever you want down the road. A sure sign of an ineffective board is the tendency of members to always agree on motions. This sad state of affairs can arise in many different ways. Members may have been recruited or co-opted; they may fail recognize the grasp of group-think; or they may simply be ignorant of the work required of them. Whatever the reason, a rubber-stamp board serves no purpose beyond ratifying the ambitions of the CEO. When the CEO is a virus, the organization has a big problem. The responsibility for regulating public, corporate, and institutional boards rests with governments. We have numerous laws and regulations to prevent minor crimes and misdemeanors by ordinary citizens. But there are far fewer regulations for members of the governing class, particularly those who run and oversee organizations. Unfortunately, there is little public demand for reform because most people pay little attention to how well they work. This paves the way for widespread board malfunction and occasional viral infection at the highest level of an organization. Governments need to put into place regulations that ensure all board members understand that an important part of their job is ensuring CEO accountability. To do this board members need to know what is really going on, and be willing to demand the CEO provide credible answers to critical questions. Governments should insist that board members be familiar with the elements of good board practice, the best practices of their type of organization, and such elementary matters as how to run an effective meeting. Government should also put into place regulations that prevent boards from entering into contracts that make it difficult to expel presidents or CEO who have been revealed as viruses. In the modern age, we have devoted enormous resources to fighting pathogens that attack the human body. Now it is time for to tackle the pathogens that attack our public institutions. 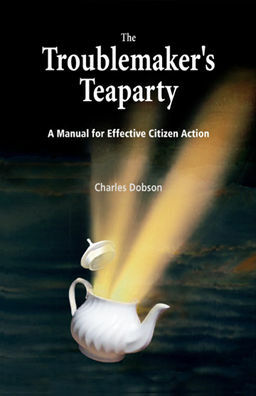 The Troublemaker's Teaparty is a print version of The Citizen's Handbook published in 2003. It contains all of the handbook plus additional material on preventing grassroots wilt, strategic action, direct action and media advocacy. You can get a copy of The Teaparty from Amazon or from New Society Publishers.